Why does our independent school matter in the mission of public education? 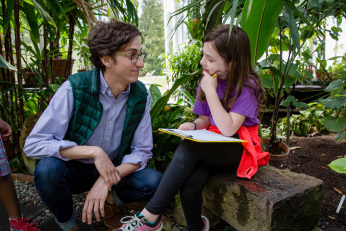 As the lab school of Smith College, we welcome student teachers into our classrooms to supplement their education coursework with practical experience. Under our supervising faculty’s careful guidance, these aspiring teachers lead lessons, provide one-on-one instruction, and form affirmative relationships with our students. They learn the art of encouragement, the science of instruction, the importance of engagement, innovation, and exploration—and, most importantly, the transformative potential of truly inspired teaching. Smith College’s student teachers begin their careers here, setting their professional baselines to Campus School’s high standards. They then carry what they have learned about teaching methods and forging connections to children and schools across the country. Our families and faculty members are proud to play a role in our shared mission to improve education for all students everywhere.